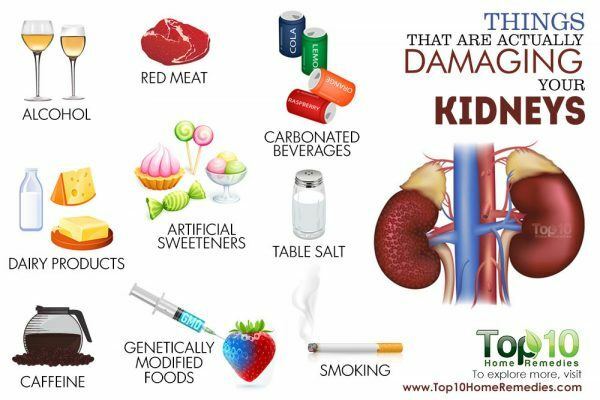 Home » Healthy Living » Are You Unknowingly Damaging Your Kidneys? Are You Unknowingly Damaging Your Kidneys? The kidneys are two bean-shaped organs, located against the back muscles in the upper abdominal cavity just below the rib cage, one on each side of the spine. The kidneys are composed of millions of microscopic structures called nephrons. These nephrons are the kidney’s functional units responsible for detoxifying the blood by filtering out the waste products, which are then sent to the bladder to be stored and eventually passed out of the body through urine. The kidneys are also tasked with the primary function of removing excess water from the body. They also help retain water when the body needs it more. Moreover, the kidneys help maintain the optimal pH level as well as regulate the level of minerals like salt, potassium, calcium, and phosphate in the body. They also produce hormones responsible for important body functions, such as controlling blood pressure and the synthesis of red blood cells, which carry oxygen and important nutrients throughout the body. Renal damage or kidney disease, hampers the ability of these vital organs to carry out these essential functions and results in the buildup of unwanted chemicals, electrolytes, and fluids in the body. Although fairly common, this loss of kidney function can progressively worsen and can even prove life-threatening at an advanced stage. End-stage kidney failure is largely incurable and can only be managed through dialysis treatment, wherein the purification of the blood is performed by a machine instead of the kidneys. Some people may resort to a kidney transplant. What health complications can a person with kidney damage develop in the long run? Can people with irreparably damaged kidneys survive without a transplant or dialysis? What is the foremost cause of kidney damage? Can renal dysfunction lead to the problem of diabetes? Which fruits and vegetables are considered beneficial for a person suffering from kidney damage? Can common infections like flu, cold, etc., adversely affect kidney health? Please provide some additional tips or inputs to help our readers maintain optimal kidney function. Chronic kidney disease (CKD) – characterized by inadequate kidney functioning that persists for longer than 3 months. Chronic kidney disease occurs due to various diseases- hypertension and diabetes are the most common causes of kidney damage in the entire world. Acute kidney disease – a sudden and complete renal failure due to insufficient blood flow to the kidney, kidney impairment due to direct injury, or an accumulation of urine in the kidneys. 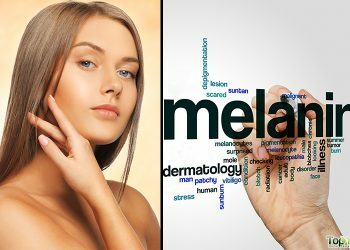 This can occur due to acute infections like malaria, dengue fever, medications, infections like pneumonia, dyes used in CAT scans, herbal medications, etc. Kidney stones – crystallization of minerals and other salts in the blood to form hard deposits within the kidney. Blockage to the urine flow- older men can develop enlargement of prostate which can block the urine flow and damage the kidney. Some women can develop fibroids in the uterus which causes pressure on the tubes coming from the kidney, blocking the urine flow. Polycystic kidney disease – a genetic condition that leads to the formation of multiple fluid-filled cysts in the kidney that comes in the way of normal functioning. Glomerulonephritis – inflammation of glomeruli, the blood-filtering tiny structures inside the kidney. Pyelonephritis or advanced Urinary Tract Infections (UTIs) – bacterial infections that spread progressively from the urethra and bladder and then to the kidneys at a later stage, if untreated. Persistently high blood pressure can put an undue strain on the glomeruli or the small blood vessels inside the kidney responsible for cleaning the blood, resulting in kidney decline. Excessive blood glucose due to diabetes can also take a toll on the functioning of the glomeruli. High cholesterol can cause blood vessels to become clogged by fat deposits, thereby restricting adequate blood flow to the kidneys. Vesicoureteral reflux is a renal disorder that causes urine to back up into your kidneys. Kidney damage due to recurring kidney infections. Obstructions in the flow of urine caused by recurrent kidney stones or an enlarged prostate. Sustained use of certain drugs – such as non-steroidal anti-inflammatory drugs (NSAIDs) like ibuprofen and naproxen and IV street medications – and toxins such as lead poisoning can cause irreversible kidney damage. Autoimmune diseases can also end up targeting the kidney and causing significant damage. Prolonged viral illnesses like HIV Aids and hepatitis B and C can lead to renal decline. Majority of the kidney diseases usually target the nephrons and remain undetected in their early stages. Since nascent kidney disease is devoid of any evident symptoms, it is only likely to be picked up via blood or urine tests that may be carried out for some unrelated problem but end up indicating a possible problem with your kidneys. If you experience any of the above-mentioned symptoms, consult your doctor to rule out the possibility of kidney disease. The main way to reduce the chances of developing CKD is to ensure that any existing conditions, such as diabetes and high blood pressure, are carefully managed. Keep your weight in check by eating a well-balanced and healthy diet. Avoid drinking excessive amount of alcohol. Refrain from the overuse of painkillers and consult your doctor for safer alternatives. Work closely with your doctor to rein in any existing medical condition that may contribute to kidney damage. Kidneys have the ability to compensate for the loss of function resulting from various renal problems, and the symptoms only become apparent when the disease has entered a much more advanced and serious stage. Thus, it is paramount that you consult your doctor if you have even the slightest inkling that all is not well with your kidneys. In case you have any pre-existing medical condition that is considered a risk factor for kidney disease and have family members that suffer from renal disorders, it is especially important that you get your blood and urine tested regularly by your doctor to assess if the kidney is functioning properly. Apart from medical issues, there are many habits that can induce or accelerate kidney damage. 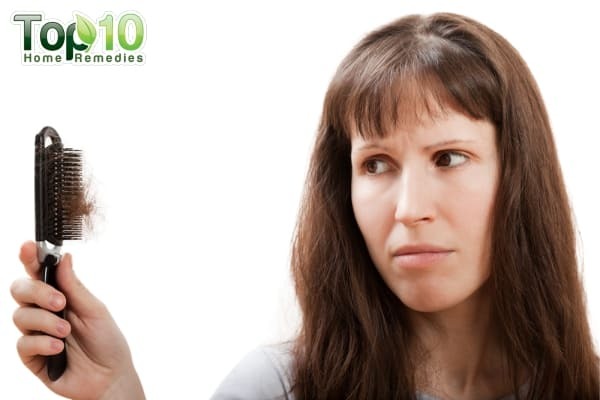 Here are 10 habits that show how you are damaging your kidneys unknowingly. When urine remains in the bladder for a long time, it can cause the bacteria breeding in urine to multiply. These harmful pathogens, in turn, pave the way for subsequent urinary tract infections or kidney infections. Moreover, retaining urine tends to overburden the kidneys, and the undue pressure can lead to renal failure and incontinence. If you habitually delay responding to the call of nature, it’s time to mend your ways for the benefit of your kidneys. No matter how busy you are, listen to nature call signals and follow them. Inadequate water intake on a regular basis is often at the root of most of your renal problems. Water is the fuel that allows the kidney to carry out its primary function of flushing out metabolic waste from the body and regulating erythrocyte production. The lack of sufficient water in the system causes blood to become increasingly concentrated and dense, and this translates to decreased blood flow to the kidneys. This, in turn, hampers the kidneys’ ability to eliminate toxins from the body, and the resulting buildup of toxins gives way to a number of health problems. According to the National Kidney Foundation, a healthy adult must drink at least 8–10 glasses (8 oz glasses) of fluid daily to keep the kidney functioning at the optimal level and the body well hydrated. However, no need to shift to the other end of the spectrum by drowning your body with an excessive fluid intake. There is something as too much water, which can be just as hard on your kidneys as the lack of it. So, do not overdo it. Regularly eating too much salt, or sodium, can also cause a significant amount of damage to your kidneys, in addition to other health problems. Sodium is one of the elements found in salt. The kidney metabolizes 95 percent of the sodium consumed through food. When salt intake is high, the kidney needs to put in extra work to excrete the excess salt. In the long run, this added strain can lead to decreased kidney functioning, thereby causing water retention in the body. Water retention, in turn, can cause your blood pressure to shoot, which again reinforces the risk of developing kidney disease. Studies have also shown that salt intake increases the amount of urinary protein, one of the major risk factors for developing kidney diseases. Hypertension is one of the most common causes of kidney damage in the world. Increased salt intake directly causes high blood pressure which in turn damages the kidney. Decreased salt and regular exercise will maintain good kidney health. Regular check-ups with the doctor are essential to track your blood pressure and kidney function. The recommended amount of sodium intake figures somewhere around 2,300 milligrams a day, which is equal to about 1 teaspoon per day. Anything surpassing this can be harmful to your kidneys as well as your overall health. Many of us have the habit of taking analgesics, such as NSAIDs (nonsteroidal anti-inflammatories), to control pain and reduce fever and inflammation. Excessive dependence on such medications or compulsive use can foster irreparable damage to different body organs, including the kidneys. Research shows that NSAIDs (such as ibuprofen and naproxen) may reduce blood flow to the kidneys and deteriorate kidney functioning. Moreover, heavy or long-term use of over-the-counter NSAIDs can cause acute renal failure or chronic kidney disease known as Chronic Interstitial Nephritis. Permanent damage to the kidney can also occur, which could lead to the need for hemodialysis or the clearance of the toxins from the kidney with a machine. If you already suffer from impaired kidney function, it becomes all the more crucial to steer clear of painkillers. If the need for an analgesic does arise, seek your doctor’s assistance in looking for the ideal choice or suitable and safer substitutes. Even with normal kidney function, analgesics should be used as directed by the physician, at the lowest dose possible and for the shortest time. Some herbal medications and nutritional supplements contain high levels of metals like lead and cadmium which are damaging to the kidneys. It is best to check with your doctor before taking any supplement. Protein is good for your health, but excessive consumption of red meat and other protein-based foods can increase the risk of developing kidney diseases. One of the key roles of the kidney is to metabolize and excrete the nitrogen by-products of protein digestion. High protein intake increases the metabolic load of the kidneys by chronically increasing glomerular pressure and hyperfiltration. This, in turn, increases the risk of ensuing kidney problems. So, limit your intake of red meat for the overall health of your kidney. Moreover, those who have kidney problems must avoid eating red meat as it can worsen their condition. Drinking in moderation is fine, but excessive alcohol consumption can cause significant damage to your kidney. It has been shown that regular heavy drinking, more than 4 drinks per day, can double your risk of developing kidney disease, irrespective of your gender. 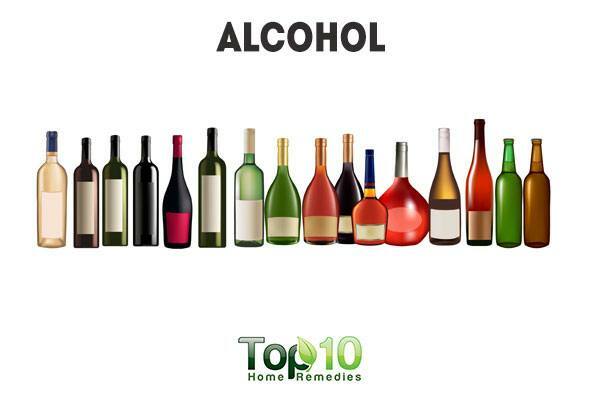 This is primarily because alcohol is a toxin that puts a lot of stress on your kidneys and liver. When you drink alcoholic beverages in high amounts, it causes uric acid to be deposited in renal tubules, leading to tubular obstruction. This, in turn, increases the risk of kidney failure. Moreover, alcohol works as a diuretic and causes dehydration, which disrupts the normal functioning of the kidney. If you like to drink, then do it in moderation. An optimum amount is generally considered to be 2 drinks a day for men and 1 drink a day for women and older people. According to the Centers for Disease Control and Prevention, smoking is bad for almost every organ of the body, including the kidney. 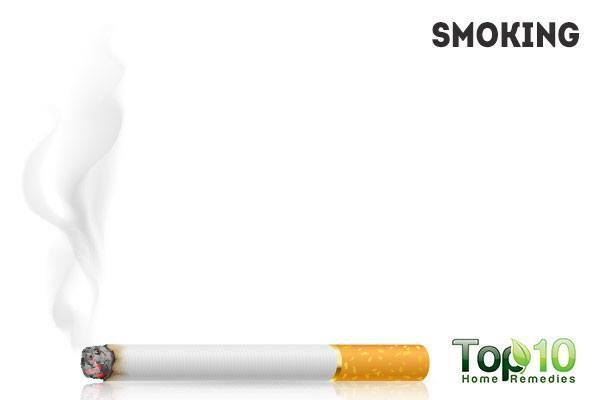 Several studies have shown the connection between smoking and kidney diseases. In fact, smoking is a leading factor behind end-stage renal disease (ESRD), according to the American Association of Kidney Patients (AAKP). Smoking increases blood pressure and heart rate as well as reduces blood flow by constricting the blood vessels in the kidneys. It can even accelerate the loss of kidney functions and worsen existing kidney diseases. Thus, there is absolutely no argument that can justify a habit as harmful as smoking, and one should swear off it as soon as possible. It might seem like a colossal task at first, but if you weigh the merits of quitting, it will give you the impetus to soldier on and accomplish this goal. Take help from friends, family members, or professionals to make the struggle a little easier. When your caffeine consumption escalates to unhealthy degrees, it can cause a sudden increase in your blood pressure. This, in turn, puts a strain on your kidneys and can result in long-standing kidney damage if such consumption patterns continue. 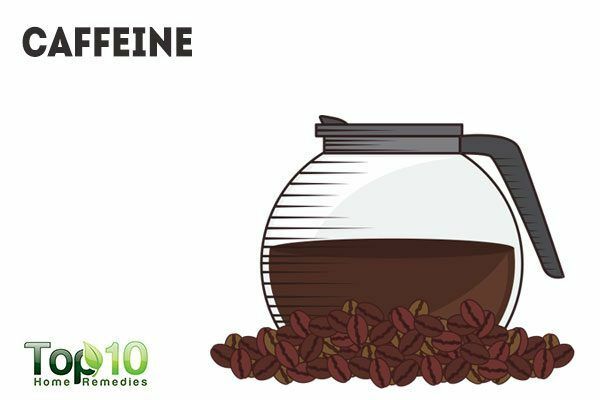 In fact, according to a 2004 study published in The Journal of Urology, excessive caffeine consumption has significant implications for the development of kidney stones as it can increase calcium excretion in the urine. Caffeine in moderate amounts will not cause health problems for most people. In fact, there is some evidence to the contrary with a study underway to demonstrate that moderate caffeine intake is actually beneficial and associated with lower risk of nephrolithiasis. Thus, drinking 1 to 2 cups of coffee or 3 cups of tea daily can actually prove counterproductive to kidney disease. When trying to maintain an optimum amount of caffeine in your system, it is essential to take into account and limit the intake of other sources of caffeine as well, like soft drinks, energy drinks, chocolate, cocoa, and some medications. Sugary drinks like carbonated beverages contain chemicals and high amounts of sugar which cause uncontrolled sugars in patients with diabetes and also kidney stones. People with diabetes must maintain tight control of sugars to avoid damage to the kidneys. Undermining common infections like urinary tract infections, bladder infections, cold, flu, pharyngitis, and tonsillitis among others, and allowing them to persist without proper care can prove detrimental to your kidneys. In fact, people who have kidney disease often have a history of not resting when they are sick and getting easily dehydrated. Without timely treatment, the bacteria or viruses responsible for these common infections can spread to the kidneys and cause considerable renal damage. So, the next time you suffer from a common infection, get it treated quickly and properly. Take your antibiotics properly and don’t exert your body until you feel better. It is best to avoid taking antibiotics by yourself and not really prescribed by your doctor. Antibiotics can cause allergic reaction in the kidney, damaging it without one realizing it. Due to busy lifestyles, many people ignore the importance of sleep. A sound sleep of 6 to 8 hours daily is important for your overall health. It is when you take your nightly sleep that the organ tissues undergo a process of renewal. Needless to say, sleep disruption or lack of adequate sleeping hours, interrupt and hinder the tissue regeneration process, resulting in damage to the kidneys and all other organs. Furthermore, studies suggest that sleepless nights may cause high blood pressure and an increased risk of atherosclerosis (clogging of the arteries), both of which have negative implications for proper kidney function. Try to adopt healthy sleeping habits and maintain a good balance between work and rest. This will greatly help protect your kidneys from health issues and allow you to live a full and healthy life. There are two types of kidney damage, one of which might be reversible while the other is more or less permanent. It is defined by rapid and progressive deterioration of kidney function within 24 hours. The classification of AKI combines alterations in serum creatinine concentrations and urine output. The most common causes are hypovolemia and nephrotoxic drugs mainly in older patients. AKI is potentially treatable and reversible, and treatment is specific to the underlying causes. However, if AKI is not diagnosed in the early stages, it can evolve into chronic kidney disease (CKD). Recently, it has been demonstrated that 24.6% of a general hospitalized population diagnosed with AKI can progress and develop CKD after 3 years of follow-up. These patients are also considered at high risk of morbid-mortality. When the glomerular filtration rate (GFR) falls below 60 mL/min/1.73 m2 for 3 months or more, the condition is referred to as Chronic Kidney Damage. Since kidney disease that has progressed to a chronic stage is not reversible, the treatment is majorly directed towards slowing the progression rate of kidney damage while sustaining as much renal function as possible. We estimate that over 850 million people worldwide have chronic kidney disease. Most people are not aware of their impaired kidney function because CKD is a silent disease with no specific symptoms at the earlier stages. If the patient starts exhibiting the previously cited clinical symptoms. If the patient has a lowered glomerular filtration rate (GFR) which drops to less than 10-15 mls/min/1.73m2, however, the dialysis treatment is started before this stage is reached in people with diabetes. In cases where medication is unable to control the fluid overload and rising levels of serum potassium or phosphorus in patients with dangerously low GFR. There are a number of underlying health conditions that can hamper the health and functioning of your kidneys. Over time, this kind of kidney damage gets worse and ends up permanently scarring the kidneys. The ultimate repercussion is End-Stage Kidney Disease characterized by complete kidney failure. Due to this kind of progressive renal breakdown, the kidneys are unable to perform as well as they should. If the renal damage continues to deteriorate such that kidney functioning becomes progressively compromised, this condition is referred to as chronic kidney disease. urinary tract problems with frequent infection. About 30 percent of patients with Type 1 (juvenile onset) diabetes and 10 to 40 percent of those with Type 2 (adult onset) diabetes can develop chronic kidney disease. However, kidney damage cannot induce diabetes. Sugar patients nevertheless have to adjust their insulin therapy in case of advanced kidney disease. People with kidney disease are usually advised to follow a special diet, which is customized according to the level of kidney damage. 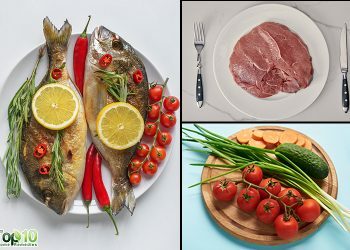 The dietary restrictions for someone in the early stages of kidney disease differ from those stipulated for people with End-Stage Renal Disease (ESRD) or kidney failure. Although there are no standard restrictions on the intake of fruits and vegetables which apply uniformly to all renal patients, it’s usually recommended to limit potassium to less than 2,000 mg per day in order to avoid dangerously high blood levels. Keeping that in mind, certain potassium-rich fruits and vegetables like bananas, potatoes, avocados, and melons should be avoided by kidney patients. If you cannot do away with them completely, one way to minimize the potassium content of staple vegetables like potatoes is to boil them in water before cooking. By and large, people with kidney problems are advised to adjust their food choices and intake as per the dietary stipulations of the Renal Dietitian Council. No, but the prescribed medication to treat these infections may be toxic and affect kidney function. Manage your blood sugar levels through regular testing and medical follow-ups, even if you are a borderline diabetic. Maintain a healthy weight by consuming a well-balanced diet along with regular physical activity. Avoid excessive reliance on non-prescription drugs. Annual kidney function assessment is particularly recommended for high-risk populations (diabetes, hypertension, obesity, relatives with chronic kidney disease). About Dr. Helal: He is the Associate Professor of Nephrology at the University of Colorado, Denver and Medical Director at Diaverum AB. He received his M.D. in 1988 and is trained in Nephrology. Dr. Helal completed his Nephrology Fellowship at Necker Hospital in Paris, France (2002-03) and trained as a Post Doctoral Research Fellow at the University of Colorado, Denver. Dr. Helal won the First Prize in fellowship at ISN World Congress of Nephrology, Vancouver, in 2011. He is also the associate editor of BMC Nephrology and sits on the Editorial Board of several medical journals. His current research focuses on Autosomal Dominant Polycystic Kidney Disease (ADPKD), epidemiology and prevention of Chronic Kidney Disease. How Your Kidneys Work. The National Kidney Foundation. https://www.kidney.org/kidneydisease/howkidneyswrk. Published May 10, 2017. Hanratty R, Chonchol M, Havranek EP. Relationship between Blood Pressure and Incident Chronic Kidney Disease in Hypertensive Patients. Clinical Journal of the American Society of Nephrology. https://www.ncbi.nlm.nih.gov/pmc/articles/PMC3206001/. Published November 2011. Nasri H, -Kopaei MR. Diabetes mellitus and renal failure: Prevention and management. Journal of research in medical sciences . https://www.ncbi.nlm.nih.gov/pmc/articles/PMC4755100/. Published November 2015. Tsimihodimos V, Mitrogianni Z, Elisaf M. Dyslipidemia Associated with Chronic Kidney Disease. The Open Cardiovascular Medicine Journal – Bentham Open. https://www.ncbi.nlm.nih.gov/pmc/articles/PMC3106357/. Published February 24, 2011. Wang HE, Gamboa C, Warnock DG. Chronic Kidney Disease and Risk of Death from Infection. American Journal of Nephrology. https://www.ncbi.nlm.nih.gov/pmc/articles/PMC3169360/. Published October 22, 2011. Floege J, Amann K. Acute glomerulonephritis . The Lancet Journal. https://www.thelancet.com/clinical/diseases/acute-glomerulonephritis. Published February 24, 2016. Igarashi P, Somlo S. Polycystic Kidney Disease. Journal of American Society of Nephrology. https://jasn.asnjournals.org/content/18/5/1371. Published May 1, 2007. Rule AD, Bergstralh EJ, Melton LJ. Kidney Stones and the Risk for Chronic Kidney Disease. Clinical Journal of the American Society of Nephrology. https://www.ncbi.nlm.nih.gov/pmc/articles/PMC2666438/. Published April 2009. Hörl WH. Nonsteroidal Anti-Inflammatory Drugs and the Kidney. Pharmaceuticals (Basel). https://www.ncbi.nlm.nih.gov/pmc/articles/PMC4036662/. Published July 21, 2010. Razmaria AA. Chronic Kidney Disease. JAMA. https://jamanetwork.com/journals/jama/fullarticle/2524193. Published May 24, 2016. Yoshimura N, B Chancellor M. Differential Diagnosis and Treatment of Impaired Bladder Emptying. Reviews in Urology. https://www.ncbi.nlm.nih.gov/pmc/articles/PMC1472851/. Published 2004. Tsao Y- T, Chen W- L, Sun Y- S. Association between fluid intake and kidney function, and survival outcomes analysis: a nationwide population-based study. BMJ Open. https://bmjopen.bmj.com/content/6/5/e010708. Published May 1, 2016. Wright JA, Cavanaugh KL. Dietary Sodium in Chronic Kidney Disease: A Comprehensive Approach. Seminars in Dialysis. https://www.ncbi.nlm.nih.gov/pmc/articles/PMC2921029/. Published June 14, 2010. Use the Nutrition Facts Label to Reduce Your Intake of Sodium in Your Diet. U S Food and Drug Administration. 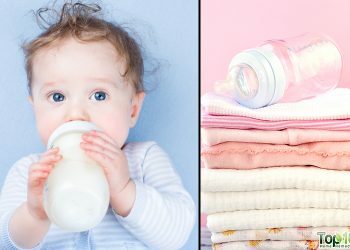 https://www.fda.gov/Food/ResourcesForYou/Consumers/ucm315393.htm. Gooch K, Culleton BF, Manns BJ. NSAID Use and Progression of Chronic Kidney Disease. The American Journal of Medicine . https://www.amjmed.com/article/S0002-9343(06)00196-3/fulltext. Published March 2007. Ko GJ, Obi Y, Tortoricci AR. Dietary Protein Intake and Chronic Kidney Disease. Current Opinion in Clinical Nutrition & Metabolic Care. https://www.ncbi.nlm.nih.gov/pmc/articles/PMC5962279/. Published January 2017. Alcohol and Your Kidneys. The National Kidney Foundation. https://www.kidney.org/atoz/content/alcohol. Published May 30, 2017. Smoking & Tobacco Use. Centers for Disease Control and Prevention. https://www.cdc.gov/tobacco/data_statistics/fact_sheets/health_effects/effects_cig_smoking/index.htm. Published May 15, 2017. Slowing Kidney Disease. American Association of Kidney Patients. https://aakp.org/dialysis/slowing-kidney-disease/. Published August 28, 2016. Yacoub R, Habib H, Lahdo A. Association between smoking and chronic kidney disease: a case control study. BMC Public Health. https://www.ncbi.nlm.nih.gov/pmc/articles/PMC3004836/. Published November 25, 2010. Saville J. Coffee and Kidney Disease: Is it Safe? The National Kidney Foundation. https://www.kidney.org/newsletter/coffee-and-kidney-disease. Published October 20, 2017. MASSEY LINDAK, SUTTON ROGERAL. ACUTE CAFFEINE EFFECTS ON URINE COMPOSITION AND CALCIUM KIDNEY STONE RISK IN CALCIUM STONE FORMERS. The Journal of Urology. https://www.jurology.com/article/S0022-5347(05)61684-9/abstract. Published August 2004. Ferraro PM, Taylor EN, Gambaro G. Caffeine intake and the risk of kidney stones. The American Journal of Clinical Nutrition. https://www.ncbi.nlm.nih.gov/pmc/articles/PMC4232021/. Published October 1, 2014. Hsiao C- Y, Yang H- Y, Hsiao M- C. Risk Factors for Development of Acute Kidney Injury in Patients with Urinary Tract Infection. PLOS ONE. https://www.ncbi.nlm.nih.gov/pmc/articles/PMC4516244/. Published July 27, 2015. Cheungpasitporn W, Thongprayoon C, Srivali N. The effects of short sleep duration on proteinuria and chronic kidney disease: a systematic review and meta-analysis. Nephrology Dialysis Transplantation . https://academic.oup.com/ndt/article/32/6/991/3059433. Published April 22, 2016. These tips are very useful for our regular maintainence of body functions. Great health knowledge u guys are passing to readers! I hav indeed gained a lot frm ur posts. Keep d train moving, Godbless u all! Really good info.please email more stuff about keeping healthy kidneys. Oh my!!! I drink too much coffee, I take 3-5 cups per day. Thank you a lot for all the informations .They help me a lot to take care of my body. Many thanks for very important information! This is a very good info for taking good care of our kidneys. May the Lord bless you for this selfless giving. Thank you. Very timely information. Thanks. Keep it up folks. This is my first time of visiting your website and I’m happy with the information cause I’m having kidney problem and there are many things the doctor didn’t tell me before but by visiting you website I have got to know so many things. God bless you and keep on giving the health information to humanity. Thanks. Its really very helpful! I have gained lots of health advices cuz of u guys thanks a lot! Thank you for that useful information, I only have one kidney , I didn’t take care of them, when I was young, so I pay attention to my body now. I appreciate your information. Bless you. this information is great and I wish each and every person should have access to it. it would be good. Please keep on serving humanity. Very good educative information. I have now known how to protect my kidnney to stay healthy. Thank you very much. Kudos to you! .more power. Thank u for this nice information on kidney. good health tips.. useful for me. Thanks for these useful tips for everyone.